When reading Anthony DeMarco’s blog, Jewelry News Network, I came across a piece of news that caught my attention: the upcoming auction of philanthropist Lily Safra jewelry collection at Christie’s. If you want, you can read the full article here. There were a few triggers for my attention: Jewelry collection, a phrase that works for me just like “cookies” for the cookie monster; a note of the collector’s refined taste and its evolution as years went by, oh curiosity…; and JAR, the little three letter word that evokes mystery & myth in the jewelry world! So, this killed my productivity, basically. I spent the whole working day fishing for more information on the collection and JAR himself. First: truth or myth – does JAR exist? This is a key question, you have to agree. Nobody has seen him, there are no photos, all you have is “he said, she said” … a girl has to wonder. Still, somebody is designing the most amazing jewelry under the name JAR. Maybe I am being too sceptical. Second: what was the trigger – why does an American college graduate (Harvard) choose to become a jeweler in Paris? This is unusual as a direction. Two of the best jewelry designers of the 20th century did exactly the opposite – Verdura and Schlumberger. But Place Vendôme is the epicentre of high jewelry, as Lorenz Baümer says “if you are serious about jewelry you have to be Place Vendôme”. Talking about Lorenz Baümer, why is it that most of the really relevant and innovative jewelry designers tend to have very unorthodox career paths? Is it a cosmic requirement? Third: how does it grow – from where does JAR draw his inspiration? Is it nature? It could be, there are many pieces in the shape of flowers or butterflies. But there are also very sculptural pieces. So, is it art? Whatever it is, the resulting jewels are always very delicate. The thinnest bands, the finest pavé, the intricate ropes around a diamond showcase a unique sensibility for gems and metal as well as female beauty. As comments about his temper filter through the web, I am also very curious about how much customers have to say in the process of creation of commissioned pieces. Do they get to say “I would like a ring, please” or not? Fourth: Why do so many of his creations end up at auction, if it’s so hard to purchase them in the first place? How can these lucky women part with such special jewels? 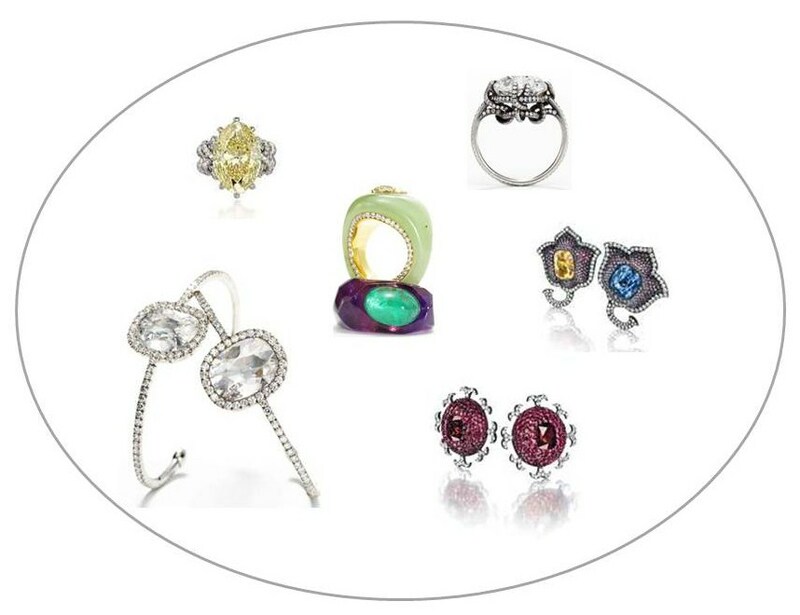 Lily Safra has put 18 pieces of jewelry by JAR up for auction. In the past, Ellen Barkin parted with 17 pieces of her own collection. Maybe it is petty of me but I don’t understand. Nevertheless, I am grateful it happens otherwise it would be very difficult to see JAR’s work and all jewelry lovers around the globe would be poorer for that. Fifth: Where in the world can I get an introduction to visit the mysterious unmarked Place Vendôme shop? You see, the first question is killing me! This entry was posted in People and tagged Anthony DeMarco, Christie, Ellen Barkin, JAR, Jewellery, Jewelry News Network, Lily Safra, Place Vendôme. Bookmark the permalink. Did you ever see the catalog of the exhibition? I can’t believe I missed it! I love your blog as well. Let´s keep in touch. Regards from Brazil and lots of bijoux bliss for you. No unfortunately I haven’t seen it either.. I buzzed the shop last month when I was in town visiting a friend who happens to design for Van Cleef. I was let in and given an appointment but because I was trained at the jewelery bench while attending Rhode Island School of Design….I was asked to leave. No one in the industry is permitted in. They have an attitude of paranoia and exclusivity. Even with money, they would not want to sell me anything. I tried to reason with them that I would not steal or copy, and emphasized that the French Impressionists showed each other’s work- but alas, the manager was unfazed. I left the store quite devastated and questioned whether I wanted to continue being in the “industry”. I dare say, being discriminated is one of the worst things any human can experience from another human. Revolution! Your story in amazing in a scary way. Thank you very much for sharing.